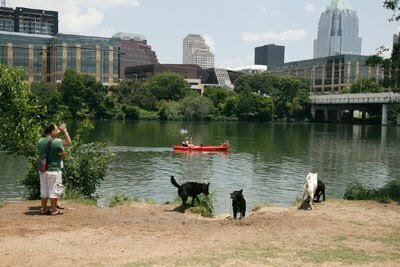 Just in time for the Buda Country Fair and Wiener Dog Races which, this year, is being called WIENERDOG MILLIONAIRE! Welcome to the world of competitive wiener dogs, a world that boasts healthy dachshunds and rabid owners. Unleash the truth as we track America's sexiest and fastest weenies on the professional dachshund circuit. Every year, tens of thousands of American dachshund owners enter their dogs in various competitions. 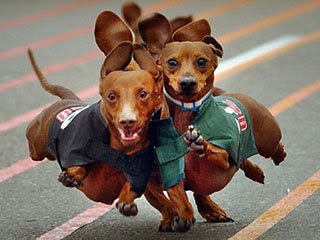 Extremely popular, dachshund races routinely bring horse and dog tracks a week's worth of attendance on a single night (in Buda, Texas, almost 20,000 hit the annual races). There's even a national wiener dog racing championships - the Wiener Nationals - that features racing wiener dogs from across the country. A more high profile type of Dachshund competition is the world of show doxies, where thousands of miles in travel and hundreds of thousands of dollars are required to compete for the spot of "top dog". In the fall of 2004 documentary filmmaker Shane MacDougall decided to chronicle the surprisingly cut throat world of competitive dachshunds for two years. The result is WIENER TAKES ALL crisscrosses the continent to get the inside scoop on what makes these champion dogs and their colorful owners tick as we visit dachshund races, hilarious "earthdog" competitions, and the Westminster dog show. Candid interviews with the world's top show dog personalities give us a crash course in wiener dog politics, and a glimpse into the divisive controversies that have long dogged the dachshund community.